While we were up in Lake George, New York for New Year's, we made a day trip to Saratoga Springs, New York. This town has a special place in my heart (I went to college here), and I had been dying to go back to see how the town has changed and to show it to my boys. It was so great to visit, and I will have much more coming up on where we ate and what we did in Saratoga later this week. 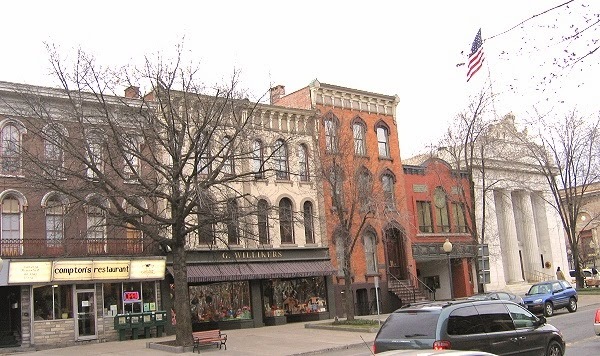 In the meantime, I thought it was funny that in today's Yahoo travel section, they have an article called "America's Best Main Streets," and one of the streets they talk about is Broadway in Saratoga Springs. I love that this wonderful upstate New York town is getting so much attention, and even more than that, I love the fact that we were just there! Also known as the "Queen of Spas," Saratoga Springs was named for its abundant mineral waters. Now a popular horse racing destination, the town features a historic main street with colonial-style buildings, boutiques and benches perfect for people watching. Stop by the Saratoga Farmer's Market for fresh, local produce, poultry, and baked goods, or head to the Saratoga Racecourse to watch thoroughbreds compete for the top title. For authentic Saratoga-style barbecue, look no further than P.J. 's, the 50's style drive-in is located on the city's main street, and visitors can enjoy tender ribs and brisket at outdoor picnic tables.